The International Mixed Media Postcard Swap Version 2.0 is ON! - You will receive 10 mailing address from me for other creative people just like you from around the world! - You will send each of those ten people one of your handmade postcards. - Then you will receive a handmade postcard from 10 other people from around the world! Sound like fun? Then join us! The rules are easy, but make sure that you read through them and follow them! Remember, you have to follow through if you sign up! A real live person will be waiting for each of your 10 postcards!! 1. Join the swap by sending me your information: full name, home address (including country! ), email, and blog or website address (if you have one). My email address is on the top left of this blog. Please note: if you are missing ANY of this information or if I cannot contact you using the email address that you provided, I will consider you as not participating. 2. Last day to sign up day is May 27th, 2012! 4. After May 27th, I will email you 10 mailing addresses to send your cards to. They might be from across the city, across the country, or on the other side of the world because this swap is open for everyone! 5. Make sure that you fix the appropriate amount of postage, write a nice message, and then send your postcards "plain" or "hidden" in an envelope for protection depending on what you've made. (It’s up to you!) The deadline for sending your postcards is June 25th, 2012. 6. Tell your friends or grab this badge to put onto your blog, linking to this post! The more people we have participating, the more fun it will be! Spread the word; share a link to this page on Facebook or Twitter, write about the swap in your next blog post. Thanks for helping make this swap AWESOME! 7. Wait patiently for the snail mail to do its thing! 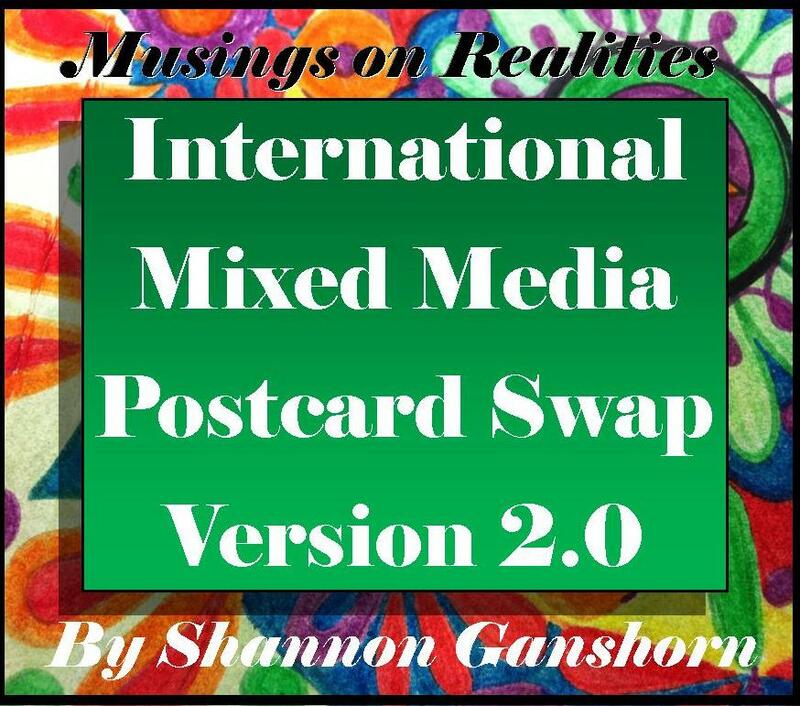 You will be getting postcards from 10 different people around the world! How exciting! Use any or ALL of these combinations, and then add your own! The possibilities truly are endless!!! Here are some examples of some combinations that I love. 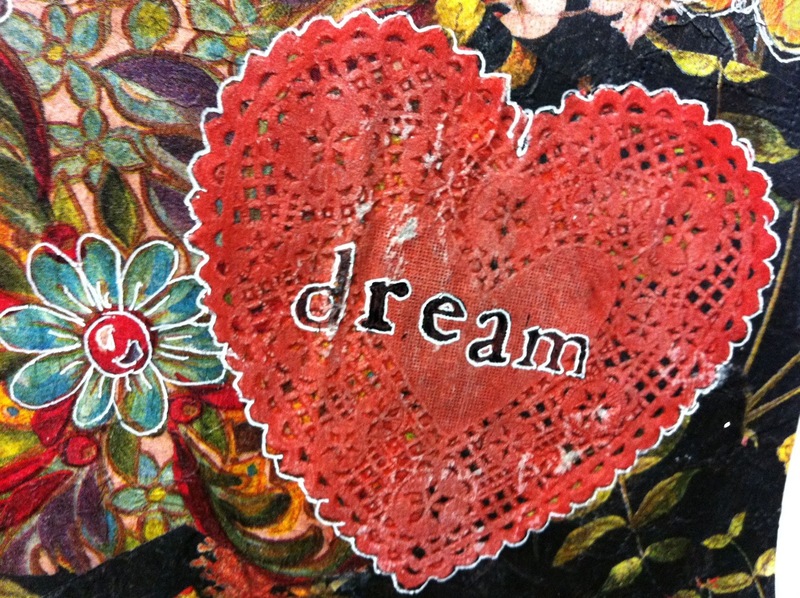 Maybe they will inspire you to make some mixed media postcards and participate in the Swap! Here is a piece that I did using a heart-shaped paper doily, napkins for the background, and ink (pen) highlights. 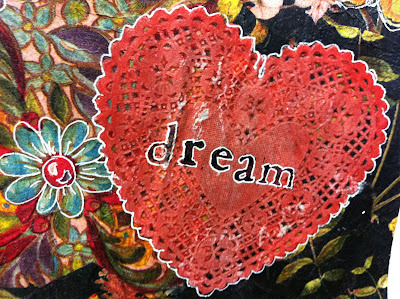 Then I used a stamp to put the word dream into the middle. See the whole piece here. Here is another piece that I did using magazine images and chalk pastel. 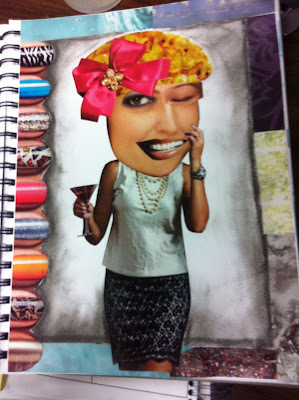 I combined a whole bunch of magazine images to create my own kooky character. Here is a portion of a collage that I did using fabrics, ribbon and different types of threads - so fun! Don’t forget! Send me your full name, mailing address, and email address to participate in the swap! My email address is on the top left of this blog! ﻿"Like" Musings on Realities on Facebook for progress and Swap updates. The first one was great. Can't wait for this one. Hope to get involved...this sounds fun! Put the badge on my blog in the meantime, and I will share over FB, too! Loved the first swap I was in. Am signing up again. Great fun! Will send you my info. Thanks for hosting this again....the first one was fun! Am signing up again, too! hello! Can't wait! I loved all my postcards last time! I just emailed you, too! I loved the last one so here I am again for this one. Oh, I'm so glad you're doing this again! The last one was so much fun - can't wait to do it again. hmm yep I am keen, really enjoyed the first one! 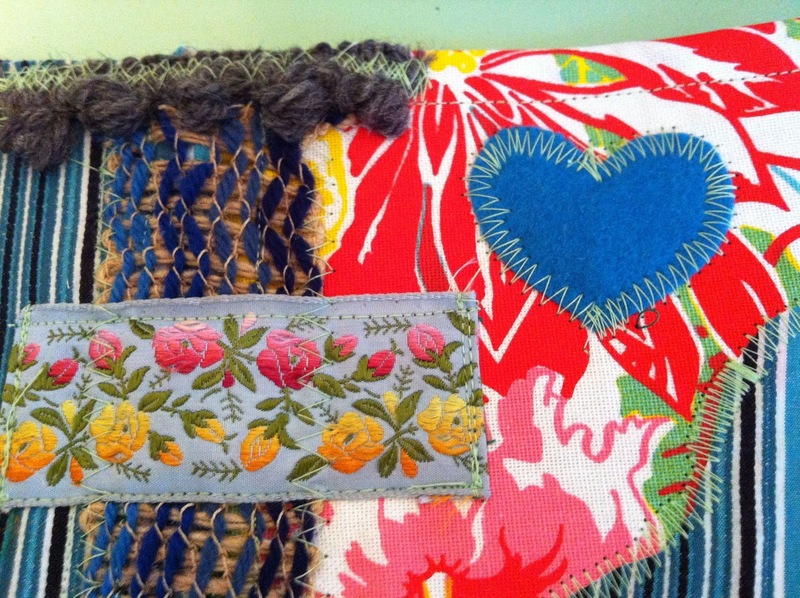 Read about it on Karen's blog and I'm in - will certainly add it to my blog as well! First time participant...great idea! Very much looking forward to it....THANKS MUCH for hosting this swap! Postcard Swap idea...amazing! Love this idea! It will be an amazing experience and a first for me to be participating in! ;) Awesome! I didn't see this answer listed anywhere...and if it is forgive me as it's Monday...blech :)...but is there a certain size these need to be? And I can't WAIT! Thanks for your comments, everyone! I'm SO SO SO excited! In regards to size, the postcards should be at least 4x6". The maximum is up to you, but keep in mind postage charges!! Pueden participar los que no hablamos inglés de forma adecuada? Je trouve l'idéee magnifique mais je parle pas vraiment l'anglais.Je voudrais participe.C'est possible? Oui c'est absolument possible de participer même si vous ne parlez pas anglais. J'ai l'impression que vous comprenez l'anglais... Est-ce que j'ai raison? Est-ce que vous comprenez les règles de l'échange?